The film’s title acts as a synopsis so I shan’t bother whittling-on, explaining the plot. Assassination was directed by Andrew Dominik, whose only film prior to this was the phenomenal Chopper, which is about an Australian outlaw (albeit of recent history). Assassination has a special connection to Devon because its director of photography was none-other than, Torquay’s own, Roger Deakins and as with his work on The Shawshank Redemption and No Country For Old Men, Deakins’ cinematography is breathtaking. The sequence featuring the train robbery is exemplar of his brilliance. Light refracts through the surrounding trees, illuminating the bandits in waiting; truly the work of a great cinematographer. The Western was so thoroughly demystified during the 1970s that the genre promptly keeled over and died. There have been the occasional revivals but no resurrection. Assassination arguably only exists, because Jesse James’ status as a folk hero has remained largely intact (throughout the years). But the man, Jesse James, was no hero. He was an ex-confederate guerrilla, who fought in support of slavery, he was a thief, and a murderer. The apparent objective of Dominik’s ambitious film was to demystify the West’s last iconic figure. However, it would be foolish to cite Dominik as the sole creative force behind this revisionist tale. The screenplay is an adaptation of Ron Hansen’s novel (of the same name). Having read the book, it’s plain to see why a director would be keen to option it. Whole paragraphs were lifted (from the book) and used in the screenplay, including the dialogue for the often derided voiceover. Hansen’s wonderfully written novel allowed Dominik to achieve a rarity in the contemporary Western, it gave him the opportunity to say something ‘new’. The notion of Jesse James as a Robin Hood figure is dispelled throughout the entire film. Typically through his reprehensible actions (on one occasion he badly beats a child) and occasionally through some rather clunkly dialogue, “You’ll hear some fools say he’s getting back at Republicans and Union men for the wrongs his family suffered during the war, but his victims have scarcely ever been selected with reference to their political views ‘. Clank! 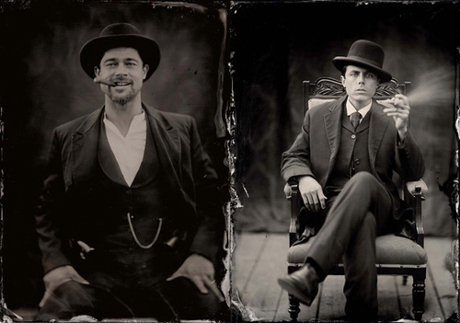 The Jesse James portrayed by Brad Pitt is a bipolar cowboy, with frequent ‘ups’, where he’s charming and generous, but also terrible ‘downs’, where his behaviour is jovial, sadistic and ruthless. The one theme underpinning the entire film is suspicion, specifically of men, as we’re in the homosocial environment of the Wild West. The suspicion and betrayal doesn’t just tear Jesse apart, but the entire gang, with everybody trying to second guess one another’s motives. I used to think the most interesting aspect of this film was its commentary upon stardom, the relationship between star and fan; what with the similarities to Mark Chapman’s obsession with John Lennon. But re-viewing the film, what really strikes me is the concept of the outlaw’s time coming to a conclusion. It is becoming harder and harder for outlaws to evade the authorities and the James brothers are all too aware of this. Dominik shows us that Frank James explicitly understands this, with his desire to quit the outlaw lifestyle and embrace a domesticated life, selling shoes; domestication being the cowboy’s greatest enemy. But the film constantly reaffirms that Jesse can’t (or won’t) be domesticated (like his brother), he may sleep in a house, but he sleeps with guns around his waist. The filmmaker constantly points the viewer to a tacit understanding; Jesse was complicit in his death. Dominik repeatedly alludes to Jesse being tired and exhausted. Jesses knows the outlaw’s time is up and so he can either choose a life of domestication, while almost certainly on the run, or he can embrace his death -as any real cowboy would -securing his mythical status through his would-be assassin, his pawn, Robert Ford. 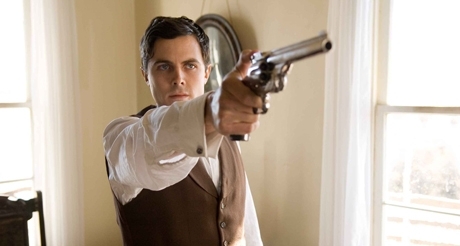 The Assassination of Jesse James by the Coward Robert Ford is without a doubt one of my favourite films of recent years, never mind genre films. But as a contemporary Western, it is a fantastic example of what a filmmaker should hope to achieve in revisiting the defunct genre, because really, there’s very little left to be said, about the Wild Wild West.